The stacked volumes of 22716 Pacific Coast Highway, recall Rudolph Schindler’s beach side Lovell house with its clean modern lines, generous overhangs and framed views of the Santa Monica bay and the Malibu pier. In a palette rich with teak timbers, meticulous wood detailing and rugged stone accents, this restaurant offers secluded moments in intimately-sized spaces as well as expansive areas for dining and event gatherings, each with their own breezy vistas. 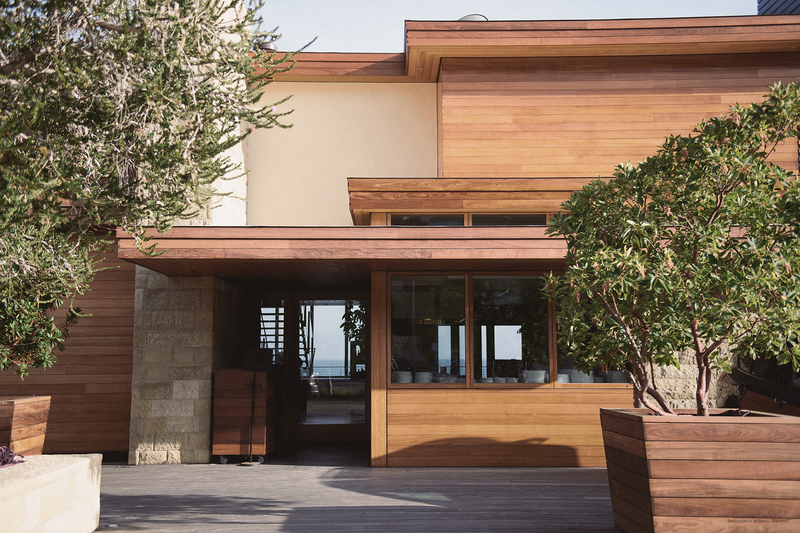 Away from the hum of the Pacific Coast Highway, the low-lying forms and earthy materials were derived from the site’s exquisite natural setting on Carbon Beach in Malibu. Passing through a tall stone wall one is escorted from the hectic PCH to the tranquil interiors filled with luxurious natural woods and stones, accented with bronze and glass. The expansive south facing glass facade then encourages the visitor to take in the panoramic views of the sea. Deep overhangs ensure that those seeking protection can be shielded from the rays, but sun-hungry guests can also chose an outdoor deck area with cozy spots between the canopy trees that recall the fashionably intimate beaches of Saint Tropez.